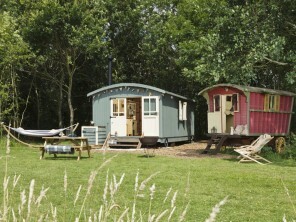 Nestled within 115 acres of meadows and woodland in rural Suffolk, the luxury lodge tents at Secret Meadows provide style and creature comforts alongside off-grid tranquillity and unspoilt natural surroundings. Come and experience camp fires, starry skies and an altogether more relaxed pace of life. The tents are fully equipped with a kitchen, a wood-burning range cooker/stove, a dining table and chairs, a comfy sofa, a private loo and shower and even a 4-poster bed. The kitchen has a butler’s sink, brass style mixer taps and a wooden drainer, as well as a country style dresser, and oil lanterns, candle lanterns and a candle chandelier provide atmospheric lighting. 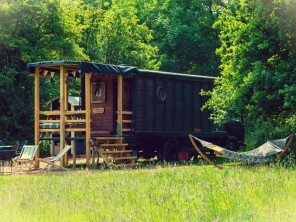 In addition to the four poster bed each tent has a cabin bed and wooden bunk beds. Each tent is nestled in its own wooded area, overlooking one of the many meadows. Outside you will find a table and chairs, as well as a BBQ and fire-bowl. Extras like luxury breakfast hampers, slow food packages and BBQ boxes are available on request and at an extra cost. You can even hire your own chicken coop for the duration of your stay! A daily allowance of wood is included as are woollen blankets, linens, games and books. Deposit is 30% of total rent. Dogs accepted outside school holiday periods. Group bookings are available. Weeks run from Friday to Friday or Monday to Monday.